I was looking for something appropriate to post on Earth Day, and then Jenelle over at TrashN2Tees told me about these little bags she makes out of upcycled t-shirt sleeves. 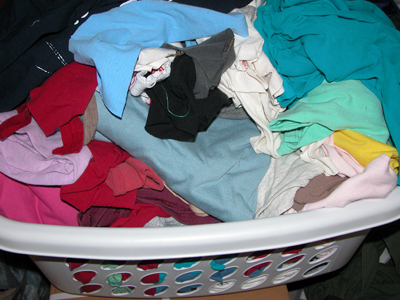 I thought it was a fabulous idea, so I went into my stash of deconstructed t-shirts, pulled out a pretty sleeve, and went to work. From start to finish this took me 20 minutes, including taking pictures. But I always have my machines and cutting area set up, so that part didn’t take any time at all. 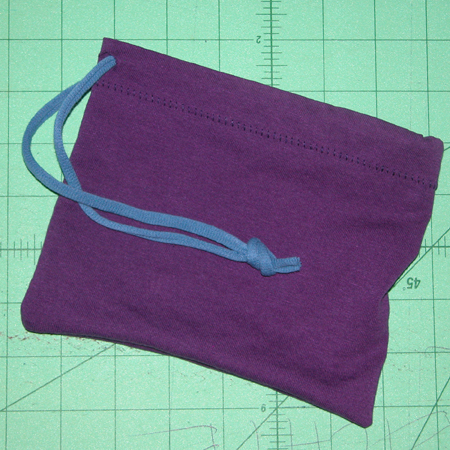 Anyhow, however you look at it, these little bags take only a short time to make. 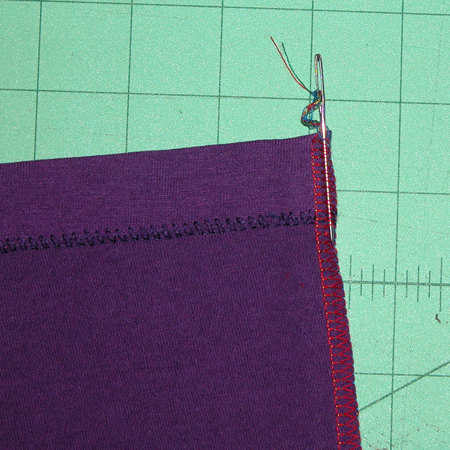 Sew (or serge) two seams, poke two holes, thread the “string,” and you’re done! Mine is very plain – no embellishment at all! But they’re much more fun if you add some applique or other embellishment to the sleeve before you make the bag (while the sleeve is still flat). 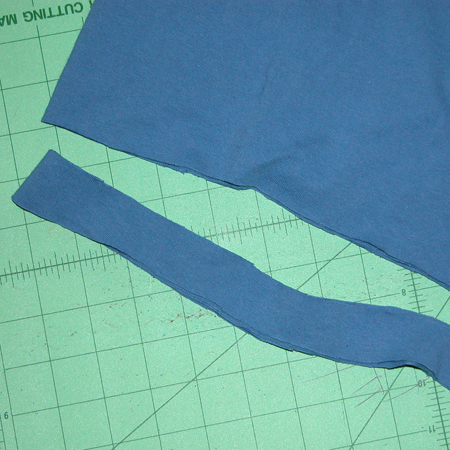 Cut the sleeve from the shirt and cut away all the bulky seams. Do NOT cut off the hem! That’s going to be the casing for the drawstring. 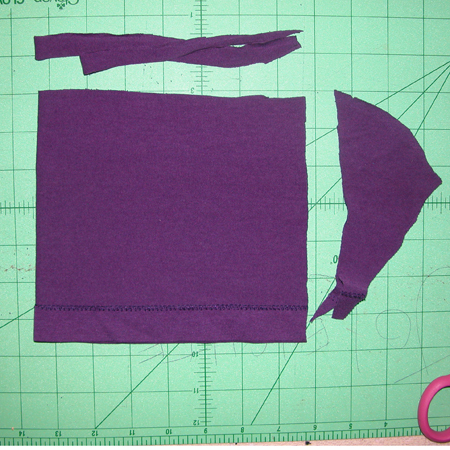 Fold in half, right sides together, and trim the raw edges to make a rectangle. Fold sleeve right sides together; trim sides and top. Serge (or stitch) the side and bottom edges. 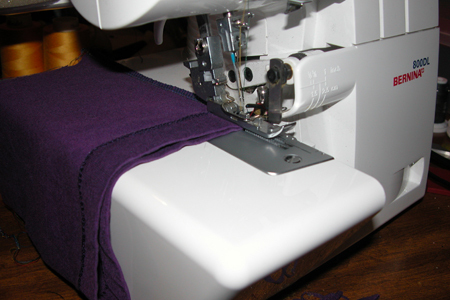 I used my serger, which trims and seams and overcasts all in one step (I love my serger!). I used a 4-thread overlock stitch, and boosted the differential feed up to 1.5 to keep the fabric from stretching as I stitched. You could also use a sewing machine: Use a small zigzag stitch (2 mm x 2mm) to sew the seams; the zigzag lets the seams stretch, so they won’t accidentally POP if the pouch is stuffed too full. It’s not necessary to trim and overcast the edges, but I think it looks nicer (I like insides to be as pretty as outsides). Serge (or stitch) raw edges (these will be the bottom and one side of the bag). Weave thread tails into the serged edge. Turn the pouch right side out and poke out the corners. 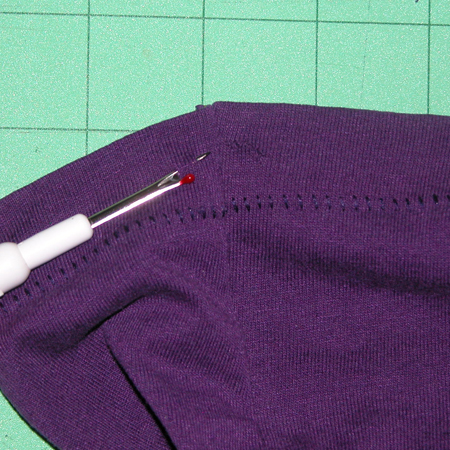 Using a seam ripper or small, pointy scissors, poke a hole through the outer layer of the t-shirt hem about 1/2″ from the seam. Repeat for the other side of the seam. Cut holes in the sleeve hem, which is now the casing for the drawstring. Cut a long 1″ strip of t-shirt, parallel to the hem. A little more or less is okay; don’t stress about it being exactly even. Grab the ends and PULL! Then pull some more! 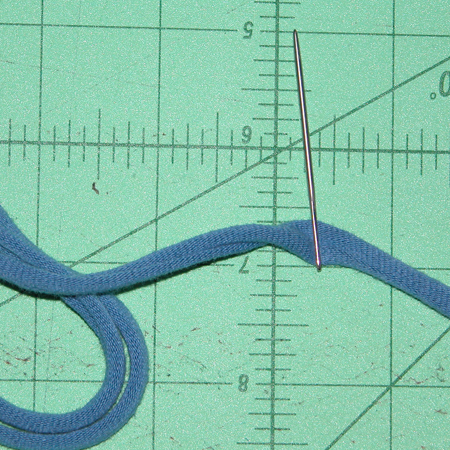 The knit strip will curl up and turn into a “string.” Cool, huh? Cut a strip about 1″ wide and parallel to the shirt hem. 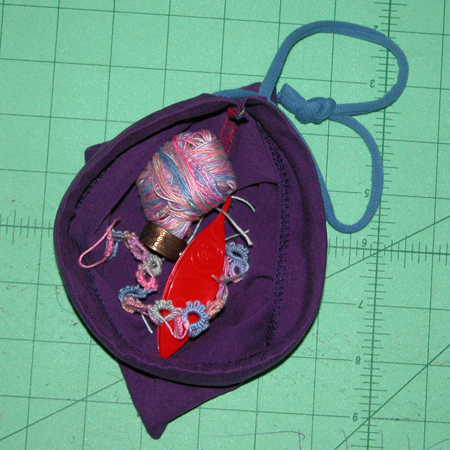 Use a large tapestry needle or a safety pin to pull the drawstring through the casing. 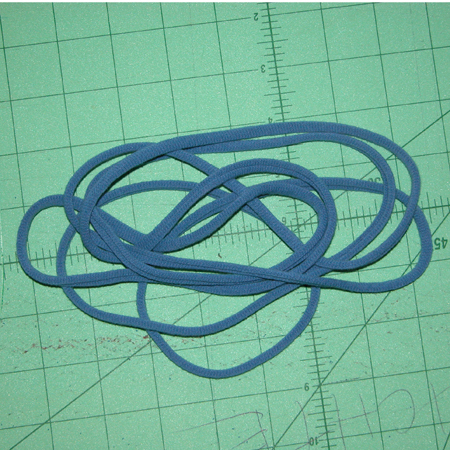 Tie drawstring ends in a knot and trim off the extra length. Fill with … just about anything little! I’m using this one to hold some supplies I’m giving to a friend who’s learning to tat. -pack a picnic and use it for dry snacks, utensils, and to keep napkins from blowing away! Hope everyone had a safe & Happy Earth Day!